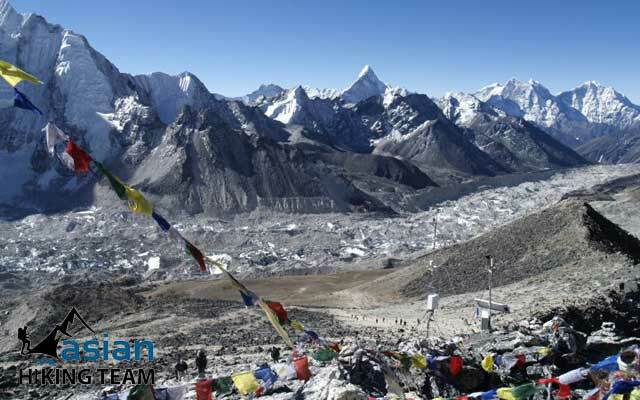 The Everest trek is understandably one of the world's most popular and magnificent hiking destinations in Nepal. It offers fascinating and pleasant trekking experience to the trekkers. Mt. Everest, the highest mountain of the world, was first climbed by Tenzing Sherpa and Edmund Hillary in 1953. Then it has become the famous trekking purposed for tourist in the world. 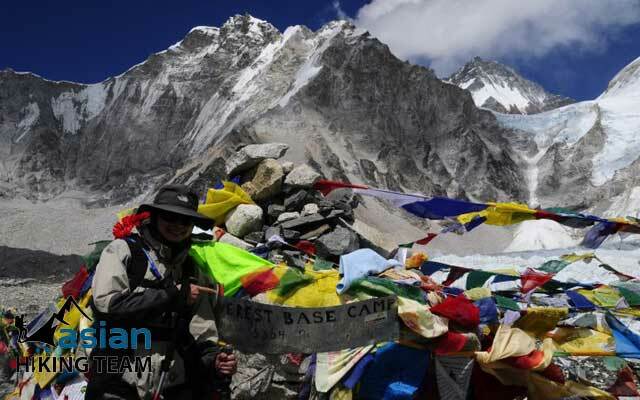 Everest trekking is famous for the spectacular view of the mountains as well as the sociability and loyalty of its inhabitants, Sherpa who are also famous for mountaineering. Everest trek provides trekkers the opportunity to enjoy incredible natural beauty of Nepal, panoramic view of the surrounding Himalaya huge like Mt. Everest (8848m), Lhotse, Makalu, Amadablam and many others. This trekking allows you chance to be familiar with the culture, religion, and lifestyle of the Himalayan people call Sherpa. 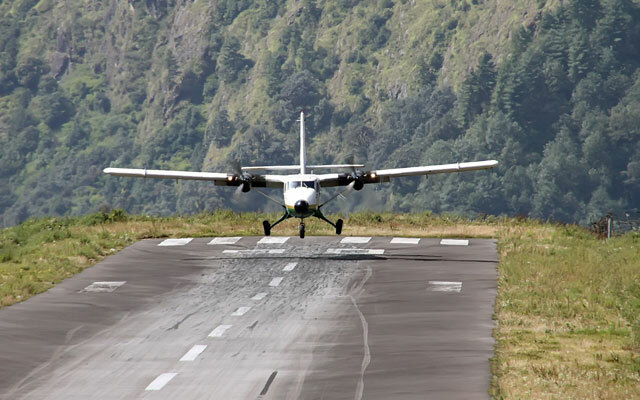 Everest trek begins with a scenic flight to Lukla from Kathmandu. From Lukla you start your trekking to the base camp of the world highest mountain, Mt Everest follows the Dudh Koshi River valley. We pass through the green terraced villages, hastening rivers, suspension bridges, lush forests with beautiful views of the world's highest snow capped peaks. 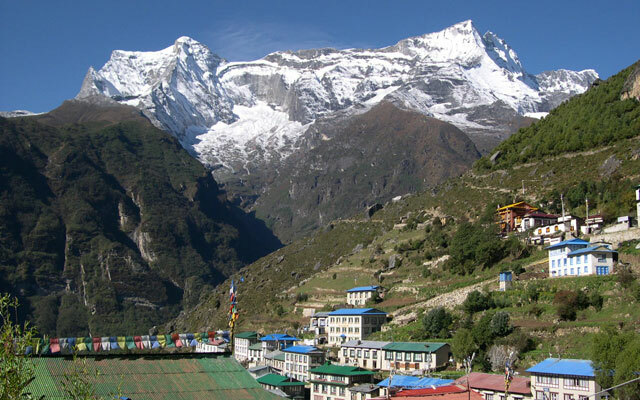 In this trek you pass through the famous places like Phakding, Namche, Tengboche, Dingboche etc. where you can get firsthand experience of their culture and life. The highest point of our trekking trip is at Kalapattar at altitude of 5545 meters, where we get an outstanding panoramic view of peaks and its glaciers, including Mount Everest. The major highlights of the Everest trekking are a UNESCO World Heritage Site “Sagarmatha National Park”, Kalapattar, Namche Bazaar, Khunde and Khunjung Valley etc. On this trek you may see the wild animals and birds like snow leopard, red panda, dance as well as rare explore various flora and fauna. We can visit trek in the Everest whole year, however the best time to go is from mid-March to May and September to Mid-December. 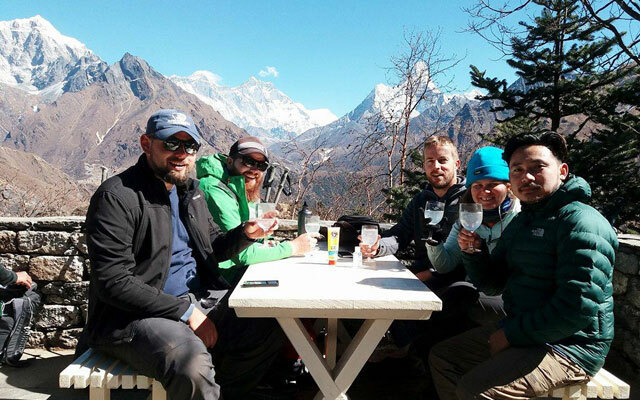 Asian Hiking Team organizes Everest trek full board package includes all your permits, accommodation, meals, guide, porters, flight tickets, all transport etc. Or guide or porter service which you can take beniefit from our guide and porter experience and knowladge. 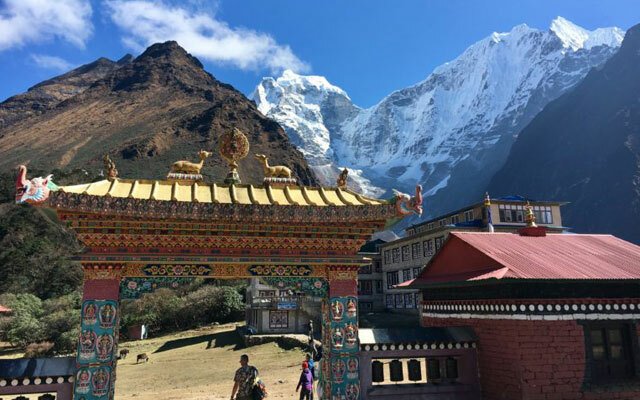 Highlight of Trekking: Picturesque scenery, culturally exciting Sherpa way of life, Tyangboche Monasteries, Sherpa museum, World highest Peak Mt Everest, Breathtaking views of Everest from Kalapattar. Day 01: Kathmandu to Phakding (2640m) - flight to Lukla (2840m) and 3/4 hours trekking to Phakding (B/L/D). Day 02: Phakding to Namche (3540m) - 5 hours trekking to Namche Bazar(B/L/D)..
Day 03: Namche Bazaar - Rest day for Acclimatization explore Namche Bazar (B/L/D). Day 04: Namchr to Tyangboche (3767m) - 4.30 hours trekking to Tengboche or Tyangboche (B/L/D). Day 05: Tyangboche to Dingboche (4410m) - 5/6 hours trekking to Dingboche (B/L/D). Day 06: Dingboche to Lobuche (4900m) - 4-5 hours trekking to Lobuche (B/L/D). Day 07: Lobuche to Gorap-shep (5170m) - trekking to Gorep-shep 3/4 hours (B/L/D). Day 08: Gorepshep to Pheriche (4130m) - Climb to Kalapattar and 4/6 hours trekking to Pheriche (B/L/D). Day 09: Pheriche to Namche (3540m) - 5/6 hours trekking to Namche Bazar(B/L/D). Day 10: Namche to Lukla (2840m) - 6 hours trekking to Lukla (B/L/D). Day 11: Kathmandu (1360m) - flight to Kathmandu, finish trip, last minutes shopping and rest (BB). Note: The itinerary is subject to change as your interest and time frame. Hotel to Airport / Hotel by Private Land transport (both way). Sagarmath National Park fees or permission. Both way Domestic Air ticket to/from Lukla. Entrance fees in durbar Square or Temple in Kathmandu. 10 Nights Accommodation during the trekking as best available Tea house / Hotel. Domestict Air ticket to/from Lukla for client/s and staffs. In the early morning, you have flight from Tribhuwan International Airport, Kathmandu to Tenzing Hillary Airport, Lukla. Upon arrival at the airport, your guide will brief you on the trek, as well as introduce you to your porters. While your Sherpas sort out and load your trekking equipments, you have time to explore Lukla. After finish breakfast, to proceed from Lukla to Khumbu, head north, past a Chorten with praying wheels and join the main tail at Choplung (2696m) in less than one hour. The proceed from their head north crossing the Thado Khola (2554m) with the awesome trekking peak Kusum Khanguru (6483m) at its head. To reach Phakding (2640m), 1.30 hours from Chuplung or almost 3.30 hours from Lukla, overnight at Hotel. Day 02: Phakding to Namche (3540m) - 5 hours trekking to Namche Bazar (B/L/D). To cross the west bank (right) of the Dudh koshi river, Continue through blue pine and rhododendron forests, pass a settlement of Metal worker (Tok Tok), village of Banker (2905m) with small lodge, see view of Mt. Thamserko (6856m) 1 hour. In the short while cross to the east (left) bank and climb up through Chumowa, cross the Khansar Khola to reach Mondzo (2835m). Enter Sagarmatha national park here, check your permit. Descend in a cleft to the west (right) bank of Dudh Kosi on a suspension bridge to reach Jorsule (2774m) 30 minutes. This is last village before Namche Bazar. We take Lunch here & proceed to cross Dudh Kosi (Bhote Kosi) again to the left side & again to cross the main Dudh Kosi, climb up till to Namche Bazaar (3440m), proceed in pine forest. Can see, first view of Mt. Everest between Lhotse & Nuptse reach 2 and half hours from Jorsule, overnight at Hotel. Day 03: Namche Bazaar - Rest day for Acclimatization (B/L/D). Today is rest day, however, we should do some activities such as to climb Syangboche airport, visit Sherpa home in khumjung/Khunde village includes Adman Hillary school or view from Everest view Hotel, 2 hours. Namche bazaar has many officials or offices, including army base camp and bank. Namche used to be trading center, where grain from the south was exchanged for salt from Tibet and it’s remains now a trading center. Every Saturday is market day. There is headquarter of Sagarmatha National park (SNP) & Sagarmatha pollution controlled Project (SPCP). Here is Sherpa Museum & monasteries too, overnight at hotel. Day 04: Namche to Tyangboche (3767m) - 4.30 hours trekking. (B/L/D). The tail rise to the settle to the east of Sagarmatha Nation Park Museum (3520m), instead, contour high above the Dudh Kosi passes Kyangsuma. Steeply down to reach Phorse Tanga, may we have lunch; this is last sport before Tyanboche. After hot lunch climb 2.20 hours to reach Tyngboche (3767m, after your arrival check hotel and visit monastery. Everyday 3-4 PM and 6-7 am is worship time in Monastery. Overnight at Guest house. Day 05: Tyangboche to Dingboche (4410m) – 5-6 hours trekking (B/L/D). Today, we start early around 7 to 8 o’clock. Half an hour down to Debuche, where is monastery and small settlements inside the alpine forest. After 45 minutes walk to cross the bridge, continues climb to reach lower Pangboche. The trekking routes follow lower path of Pongboche. It is worth to visit Monastery if you have time, its takes 45 minutes extra. An hour walk to reach in small settlement call Somare, may have a lunch in Somare then gradually walk up. After one hour walk from Somare, there are two ways, one heading to Pheriche and other is Dingboche. Right hand side direction is way to Dingboche 4410m, 1 hour from junction. After arrival, have a short drinks with rest and climb 200 meters over the Nagarjun hill because of everyday we “ascent high and sleep in low”. Overnight guest house/Lodge. Day 06: Dingboche to Lobuje (4900m) - 4-5 hours trekking (B/L/D). After breakfast, we start trekking climb the ride the hill. Over the hill with beautiful view of Tawache, Cholatse, Amadablam, Makalu, Island peak. Trek continues to Dukla 4680m, may we have lunch and climb to Dukla/Dhukla pass 4800m where many memorials monuments who died in Everest summit. It takes 5 hours to Lobuje 4910m from Dingboche, Overnight at lodge. Day 07: Lobuje to Gorap-shep (5170m) – 3/4 hours trekking (B/L/D). This is another hard day because of we walk over the glacier. Early in the morning leaving Lobuje, after lunch in Gorap-shep within 3/4 hours, This is option trip for you either you can visit the base camp even not view from base camp, we will head up to Everest Base camp (5365 meters), and return to Gorak-shep at elevation of 5180 meters. We are likely to see the teams of Everest Expeditions. The view of the Khumbu Icefall is spectacular. We then return to Gorak Shep for to spend our nights. We walk over the moving stone with jump so it does hard, be careful to walk, overnight at Guesthouse. Day 08: Gorepshep to Kalapatter and trek to Pheriche 4010m – 2 hours Kalapattar (5545m) climb and 5 hours trekking (B/L/D). After reaching Base camp of Everest our aim today is to trek Kalapattar (5545 meters) a small peak. This will be difficult, but rewarding trek. We start early morning before sunrise to reach the viewpoint that offers some of the best views of Mount Everest as well as other panoramas of the surrounding mountains. Kalapattar means “Black rock”, most excellent view point in the world. Returning to Hotel, after late breakfast descend to Pheriche at elevation of 4010 meters 5 hours, overnight at Guesthouse. Day 09: Pheriche to Namche (3540m) - 5/6 hours trekking (B/L/D). Today, start late because of hard trekking day in yesterday. Following down and up trail from Pheriche to Namche Bazar. 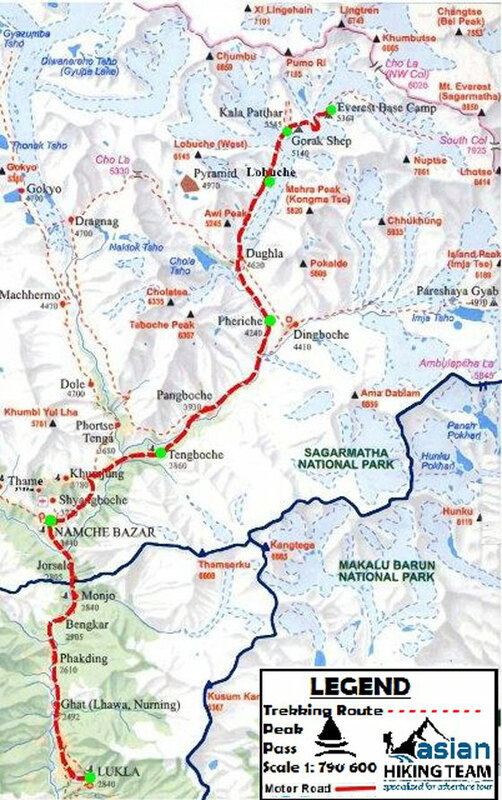 First 3 hours bring you down passing Pangboche, Deboche, Tyangboce and crossing bridge to reach Kangjuma and little flat to reach Namche Bazar another one and half hours. The trail also takes you to the area of the endangered Musked Deer, Himalayan Thar, and Pheasant Birds to the area of the Pine Forest, to the course of the Dudh Kosi River, and to the hills of the small villages 5.30 hours, overnight at guesthouse. Day 10: Namche to Lukla - 6 hours trekking (B/L/D). Today is our last day of our trek so star bit early. The trekking route we follow as same as day 01 and day 02. Finally, we return to Lukla from where we have started our trek. We would also like to share our trek achievements with other trekkers, as well as we would like to explore Lukla. 6 hours trekking, rest, final celebration day in mountain, overnight Hotel. Day 11: Lukla to Kathmandu - flight to Kathmandu, finish trip (BB/L). Enjoying your last glimpse of the mountains you have recently visited for one last time on the 35 minute scenic flight back to Kathmandu. On arrival in Kathmandu, we are met and transferred back to our starting hotel, end our trekking, shopping, relax, overnight in Hotel. All guest houses have boiled water for trekkers. And on the main trekking routes it is possible bottle mineral water to drink. You can use Iodine table or others purify drops. It is noticeable that during the camping or home stay trekking we provide the boiled water to our clients. The guide will make sure that water is safe for drinking. Our services are intended to offer quality and value for money, together with a rich, varied and a rewarding experience. We have built our reputation as the best travel agent in the country for the best service provider. Our prices of all the tours are highly competitive and unmatched with any other local tour operators. We operate trekking with three different; Full organizes service - you want to be free from all concerns to enjoy this experience to the fullest. Guide and documentation only - you prefer to carry your own pack, own accommodation and meals but want to benefit from the guide's experience & knowledge and documentation. Porter(s) service only - you know where you are going & no additional information is desired but you need to helping for carry and documentation.